How many natural lakes do you think Orange County, CA has? True, there are a few lakes in OC, but as with alot of things in Orange County, most of them are not natural. The answer is ONE. Just one. One small, unassuming lake tucked away in the James Dilley Preserve off Laguna Canyon Road. At 12 acres, Barbara’ Lake may not be Lake Superior, but she certainly is pretty. Mari and I met some friends and introduced them to the Laguna Coast Wilderness Park. We have hiked quite a few trails in this park but we still hadn’t seen the lake! Since the trail from the Nix Nature Center to Barbara’s Lake is flat, we decided it was a great hike for our toddler foursome to take on. We began with a quick loop around the 1/2 mile nature trail (named Mary’s Trail) and admired all the sights and scents of the coastal sage scrub habitat. Then we headed out south on the Little Sycamore Canyon Trail which lead us under the road past more great scenery and over towards a little pond. Now this may or may not be Bubble’s Pond. I seem to have found conflicting reports on the internet as to its exact location. What is the significance of Bubble’s Pond? Well back in the early eighties a hippo escaped from the (now closed) Lion Country Safari and took up residence for 19 days in the area! Last month I entered a little place called food heaven. It was a land filled with seafood, spice, pastries and pork. I may have gained 5 lbs and taken 5 years off my life in the process, but it was all worth it. Where is food heaven you ask? Well honey, its down on the bayou of course! I could go on and on about how amazing the New Orleans Jazz Festival was (and believe me, I will in another post) and about how I plan on going back every year (because I do) but today I want to talk about the food. The glorious, glorious food. Every single food item that I sampled was fantastic. I was lucky enough to attend the festival with some seasoned veterans who guided me through all things Jazz Fest related. Now I want to pass my new found knowledge on to you so you will be prepared when you visit (because you REALLY SHOULD). THE BEST PO BOYS: You absolutely CAN NOT go to Jazz Fest and not eat a Po Boy (or three). They are the classic New Orleans sandwich. 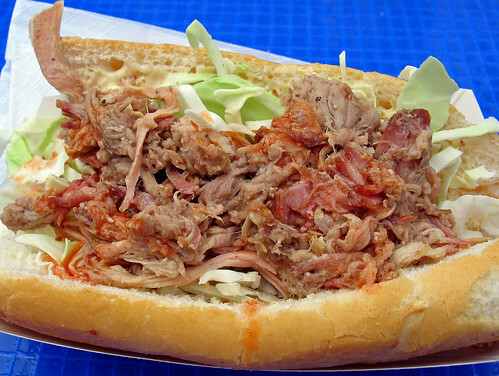 We all agreed that the Cochon de Lait Po-Boy, a flavorful shredded pork sandwich with an out of this world sauce, was one of the best. I don’t know what they do to that pork but I do know that I have found myself waking up in the middle of the night screaming “I need more Cochon de Lait!”. The Fried Softshell Crab Po-Boy was unlike any other crab sandwich I had ever had before. So crunchy, so crabtastic, so perfect. I never knew you could eat the shell of a soft shell crab and I certainly couldn’t imagine it would taste so good. Finally, you HAVE to try alligator while you are in New Orleans so why not try it in a po-boy? The Fried Gator Po-Boy is actually very good and yes, alligator does taste like chicken. BEST USE OF CRAWFISH: Crawfish is a Jazz Fest staple and the Cajuns know how to turn those lowly mudbugs into some of the most tasty cuisine you will ever experience. The Crawfish Beignets are so rich and flavorful. 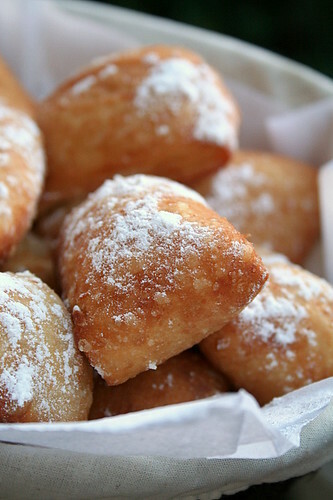 The flakiness of the beignets compliments the tender meat of the crawfish beautifully. However, the award for best use of crawfish of all time goes to whoever created Crawfish Monica (I am assuming it was someone named Monica). Wow. In this dish pasta goes Cajun and let me tell you, its the best decision pasta has ever made. Its creamy, spicy, crawfish heaven. I also have to recommend staying at the French Quarter Suites while in New Orleans. 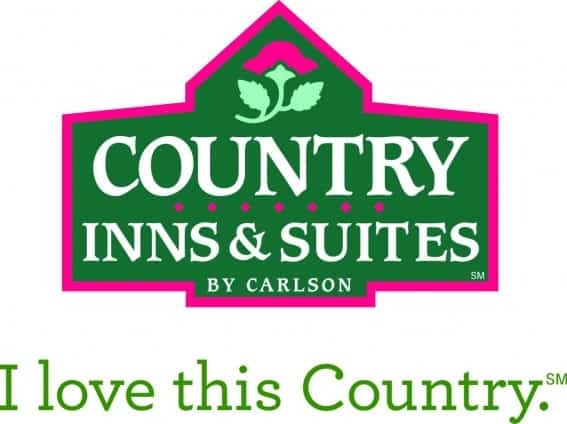 The rooms are spacious and accommodating and every Saturday of Jazzfest they do a crawfish boil for all their guests. All you can eat crawfish, fried chicken, potatoes, corn, salad, beer, and soda. It was wonderful. I have never eaten so much crawfish in my life. It just kept coming!!!!! BEST SWEET TREATS: You can’t come to New Orleans without trying Cafe Du Monde’s Beignets and Cafe Au Lait. Lucky for everyone in attendance, Cafe Du Monde has a stand at the New Orleans Jazz Festival. In my opinion, there is no bad time for beignets and an iced Cafe Au Lait is perfectly refreshing after spending hours in the hot sun. If you are looking for a dessert to go with all that Cajun goodness, try the Mini Pecan Pies. Nothing says sweets from the south quite like a pecan pie and these little tid bits of heaven are sure not to disappoint. I just wanted to let you know that I did a guest post over at the blog of one of my dearest friends, Debi, at Who Says Eight is Enough. Her and her NINE kids are currently on a cross country road trip so I thought I would share some road trip experiences of my own. I would love it if you took the time to head on over and check it out here. I am really looking forward to heading back out on the road with my family next month! For so many of us, Memorial Day Weekend signals the opening of camping season. The weather is warm, the rain has slowed, and great outdoors is calling. When I lived in Northern California, we spent several Memorial Days at Englebright Lake. Located in the California’s Gold Country outside of Nevada City, Englebright is a quiet lake with a houseboat studded marina that seems to be off the radar of most Californians. Every year, we rented a large party boat with a bunch of friends and made our way to one of several boat-in camping areas located on the lake. It was so much fun to pitch our tents on the oak studded shores and circle our chairs around the campfire. The men played horseshoes and had tri tip cooking competitions while the women lounged in the sun or climbed up the hills on hikes to the dam. If the weather was warm enough, we would take the boat out to the middle of the lake and jump off the second story into the freezing water below. It was a great tradition that we all looked forward to every year. Sadly, my last visit to Englebright Lake was when I was pregnant with my children. Evidently, air mattresses and twin filled bellies do not work well together. One night on the air mattress was enough to pull a bunch of muscles in my stomach (an injury I still feel the effects of) and cause me to have to leave the campsite in tears. I refuse to let that ill-fated visit be our last. I look forward to one day taking my kids on a camping trip at Englebright Lake with the children of my friends who shared in those trips of years past. We will share our “under the radar” location with a new generation and hopefully start new traditions in the process. In the meantime, if you are in Northern California and looking for a fun spot to take the family, check out the boat-in sites at Englebright Lake. I hope your family can create some fond memories as well. Sometimes all you need in life to make you happy is a Mariachi band and a dancing horse. Well, at least that’s all my family needed to declare our outing to Heritage Hill’s Fiesta Days a rousing success. We knew there would be butter churning, even candle making, and of course there would be a celebration of our area’s Mexican heritage. But the frantic hooves of a stallion stomping to the beat of the Mariachi caught us by utter surprise. I imagine the caution tape that was placed in front of the stage where the dancing horses performed was to keep rabid fans who had been entranced by the rhythm of the Mariachi music from coming up front and trotting alongside the professionals. Mari was one of those rabid fans. Her eyes danced and her hands swayed to the beat. She furrowed her brow as she tried desperately to understand why no horse she had rode in the past had ever stepped to the beat of the music she so sweetly sang. She stared dreamily at the man who rode those magical horses as he crooned love songs while wearing his glitzy ensemble. It was if he stepped directly out of her toddler imagination: a snazzy dressed singer who danced with horses. It wasn’t just Mari who swooned at the performance. Women of all ages seemed to be captivated by the man who could make horses dance. After the show, they lined up to get his autograph and smiled for the camera next to their dream boat. There was plenty more fun to be had at Fiesta Days beyond the dancing horses. The kids enjoyed hand churning ice cream, learning how to make their own hand dipped wax candles, and making their own jump ropes the old fashioned way. We watched people perform traditional Mexican dances and tried on bonnets inside the one room schoolhouse. It was a wonderful afternoon and while the candles and clay pots we made will become fixtures in our home, those horses dancing to Mariachi music will stay firmly implanted in my memory forever. Playing along with two for Twos-day at Who Says Eight is Enough. Back before there was Mari and Ben, there was Toby and Raley. They were my first children and the thought of leaving them behind for a hike or a camping trip was incomprehensible. They wagged their tails and happily hopped in the car and went along with whatever journey I had up my sleeve. Today, the dogs don’t join us nearly as many trips as they used to because honestly, two toddlers are hard enough to wrangle, let alone two dogs! Luckily, things are getting easier. Soon Toby and Raley will be hopping back in the car and walking alongside us on the trail. Until then, I have memories of trips past, including the one we took to McCloud Falls. McCloud Falls are actually three different waterfalls located within two miles of each other along the McCloud River in Northeastern California, not far from Mt Shasta. There is a trail that runs along the river connecting each of the falls and the entire roundtrip hike is 3.4 miles. Its a great little hike for families with three different destinations along the way! The Lower Falls are the most popular due to their accessibility. They are only twelve feet high but the water takes a powerful plunge over those twelve feet into a wide pool below, creating a beautiful scene. The base of the falls is a popular spot for swimming and picnicking. The edge Lower Falls is also a popular cliff jumping spot. There was absolutely no way you were going to get me to take the plunge (one fall off a cliff will do that to you) but Paul and my friend Kristi were happy to take the plunge over and over again while Toby howled with worry. The Middle Falls are the most impressive of the trio. They are 46 feet tall and nearly 100 feet wide. The area surrounding the pool has plenty of boulders around it, perfect for soaking up the sun after swimming in the chilly waters at the base of the falls. The Upper Falls are just a couple minutes up the trail from the Middle Falls and shoot over the edge to a pool 25 feet below. Most people only view them from the platform above but I have read that you can scramble your way down to the bottom. Camping along the McCloud River is a wonderful way to spend a family vacation and explore a part of California that few people ever see. I look forward to taking Mari and Ben to McCloud Falls with my original babies one day, and making some new memories as a complete family. I am happy to announce that I have taken a new position as Blog Editor in Chief for the family travel website, Trekaroo. I fell in love with Trekaroo late last year after discovering it through a friend and never thought I would ever actually have an opportunity to be part of the team! I will still be posting on Double the Adventure, but I hope you will sign up and follow me along at Trekaroo as well. We have some great giveaways coming up (including the current Hawaiian vacation giveaway) and lots of great projects in the pipeline. If you are interested in reading the wonderful welcome post that Trekaroo wrote for me, you can read it here. Working with a team dedicated to the world of family travel really is a dream come true and I would love nothing more than for you to join me on this new journey. THIS AUCTION IS NOW CLOSED. THE WINNER IS JULIE BOUFFARD!!!! CONGRATS JULIE! From now until May 8th, I am holding a give-away to help benefit Whatchagonnado.org, which is an organization that was founded by Charley & Jessica Whitt to honor their daughter Tuesday. Although their site is not completely up and running yet, the idea they have is (it will be up by mid-May). And, of course, it will also help to provide funds for Pediatric Cancer Research. Tuesday was their beautiful twin daughter who bravely fought and sadly lost her 8 month battle with stage 4 neuroblastoma in January of 2009. They learned firsthand what cancer does to a family and they want to turn their pain & their loss into something to help others. And myself, and all of Jess & Charley's friends, want to do anything we can to help them achieve their goal and make sure that the loss of Tuesday is never forgotten and always has purpose. A National Geographic Prize Pack which includes a subscription to the National Geographic magazine of your choice (National Geographic, National Geographic Traveler, National Geographic Kids, or National Geographic Little Kids), the National Geographic Guide to the National Parks, and National Geographic Our Fifty States! That’s an over $65 value! All you have to do to enter to win this auction is simply leave me a comment letting me know you are interested in winning this fantastic prize pack and then be sure to donate $1 per entry to the Tuesday Fiona Whitt Foundation, which benefits Whatchagonnado.org. Just click on the donate now button below. Also, head on over to the Tuesday Blog Party to see what other fantastic items are being auctioned off by clicking the image below. There are lots of great auctions and all it costs is one dollar to enter each one (unless otherwise specified). If you would like to make a donation for one lump sum, instead of many individual donations, please feel free to donate however is easiest for you. If you end up donating $10, but only find 5 auctions you are interested in, you can use those additional dollars as additional entries (Just let me know how many entries dollars you donated towards the prize pack and I will give you an entry per dollar). Thank you so much for supporting a great cause and remember to have fun! This post was originally written by Debi Bouffard over at Who Says Eight is Enough. I found it to be so powerful and inspiring that I wanted to share it with all of you as well. 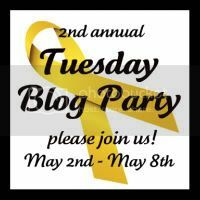 Tomorrow is the 2nd Annual Tuesday Blog Party. 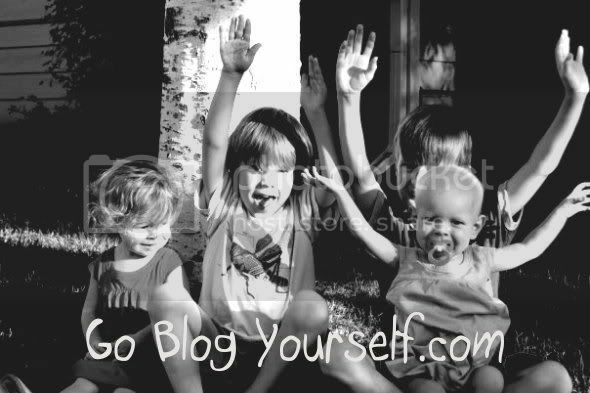 Bloggers from all over the blogosphere will be giving away fabulous prizes all in the name of Pediatric Cancer Research. You can host your own giveaway or just participate by bidding on a few items for $1 a piece. Either way, please help us raise money and awareness about a disease that took a little girl who so many of us love so much and can never forget. 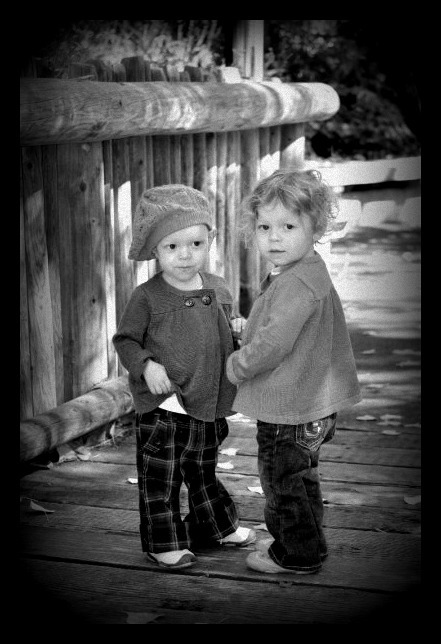 They are the beautiful children of my friend's Jess & Charley. They are privileged children. Privileged because they grew up in a home full of love, in a family that envelopes the very meaning of home... where the world revolved around happiness. and exploring. and adventure. and love of man. and earth. Their parents did everything right. For their kids. Healthy food. Healthy living. Happy life. They did everything they should do. They loved their bodies. Their children. Their world. They ate healthy. They lived strong. They fought hard. Every.single.day. There's a big gaping hole where Tuesday once was. A hole that everyone can feel and yet no one can fill. All the prayers, the tears, the hugs, the love.... none of it touches that space. But they still feel love and hope and happiness. And that is why I do what I do. To help bring them any bit of happiness I can. And part of that is to make sure Tuesday is never forgotten and that her legacy lives on forever. Not because the family asked it of me, but because I need to do it for them. Because I love Tuesday and miss her. 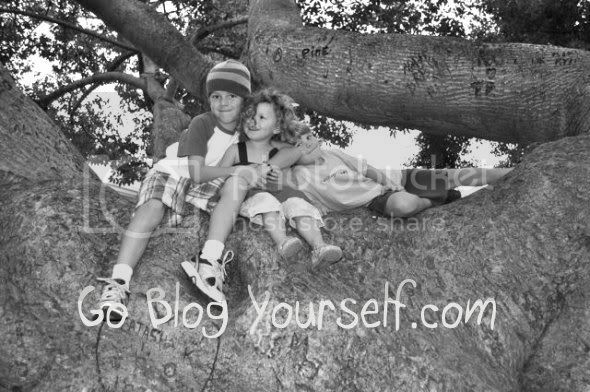 Tomorrow, the Tuesday Blog Party begins. Be a part of it and help us make a difference. For all of the children fighting cancer and winning. And especially for the ones who aren't.